Which Tipster Turned £2k into £4,900 in 12 months? Smart Betting Club members are now absorbing the feast of tipster statistics contained in our latest Tipster Profit Report. In this quarterly report we reveal the very latest profit figures from the 50+ tipster that we proof. Our easy to follow tables and editorial recommendations make it simple for you to find out not only who the best tipsters are, but who the right tipster is for you! > The niche football specialist who turned £2k into £4,900 in 12 months. > The FREE racing tipster who grew his bank by 105% last year. > The sports AND racing service who gave subscribers a 250% Return on Capital. 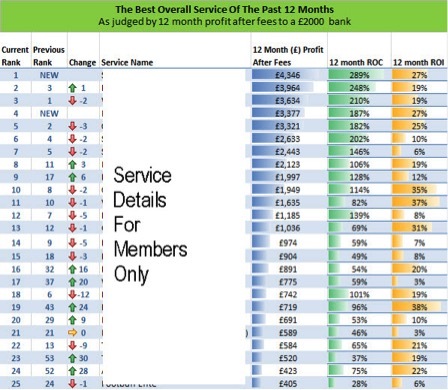 One of our most popular reports is the top overall tipster from the past 12 months. This is AFTER subscription fees have been deducted. We have blanked out the names of the tipsters as this is for full members only (after all, it’s a secret! ), but as you can see – the top tipsters are making an excellent profit based on a £2,000 starting bank. This month there has been a shakeup at the top, with two new entries in the top four. Few of these tipsters are household names and we pride ourselves on focusing on the bottom line of tipster results rather the quality of someone’s website. We also show other metrics such as ROC which stands for Return on Capital as a percentage – For example 100% ROC means you have doubled your original betting bank. ROI represents your profit on turnover – For example, 20% ROI means you profit 20 points for every 100 you stake. We slice and dice the tipster data in lots of different ways so you can find the best tipster to suit your needs. This means you can quickly and easily find the most profitable services out there. Our service is funded by our paying membership, which means we are free to make independent reviews of tipsters without any conflict of interest. You can pick up your copy of this latest report, the instant you join our service at the Smart Betting Club with full access to our exclusive members-only area. Top tips to improve your betting profits, impress your friends and bluff your way to professional betting. Betting can be a social activity, with groups of friends sharing the exploits of their weekend accumulator or lumping on in the final race of the day during a beer fuelled day of the races. 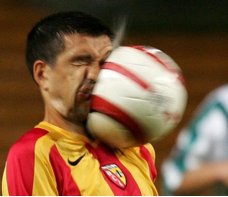 Professional betting can at times feel the opposite of this. It can be a lonely affair for the dedicated punter who updates his spreadsheets and tries to keep a level head and ignore the more emotional aspects of betting. So how do you balance a professional approach with not feeling like a stick in the mud? The weekend coupon is a bookmaker’s bread and butter. For many groups and sports teams across the country, the simplicity of ticking numerous teams on the coupon is a bit of fun and like the lottery offers the chance of a big pay-off from a small initial stake. The problem is that, like the lottery, the weekend acca is stacked heavily against you. By offering such easy betting, the bookie often offers poor odds. By taking multiple bad bets, you’re multiplying the poor value and therefore the likelihood of you earning money in the long run. So how can you play the weekend acca and keep your betting sanity? Few professional punters play weekend accumulators, but there is a way to stick to your rules and even increase the chance of that unlikely jackpot. Bad Acca: Backing five short priced teams because “they’ll win” and the combined odds are more attractive than the individual odds. Good Acca: Backing five or more teams at various odds because their odds are bigger than they should be, not just because you think they are ‘bankers’. You’re not aiming for that particular acca to always win, you’re aiming to win money in the long run. So how do we source the right bets? Using one of the recommended tipsters that we proof in the Smart Betting Club is a great place to source such bets, especially using our bespoke combo method. If you’re on a budget though, there are some good free options available. One option is to utilise the excellent FREE Fink Tank ratings made available via Decision Technology. 1) The ratings display an estimated probability of an outcome such as Aston Villa to win at 44.7%. 2) To convert percentages into odds, take 100 and divide it by the percentage. 3) 100 divided by 44.7 is 2.37. 4) So the ratings are saying that the odds should be 2.37, but you can get 2.47. 5) Result! Aston Villa is a value bet! You then repeat the process for all the outcomes – you can get the full methodology free here. It’s all free, but can be time consuming, so to save you the bother, we provide weekly value qualifiers on our member’s forum. We also identify Asian Handicap value bets, with our AH+15 Value system providing a 100% return this season to date. In fact one member recently landed a 58/1 six fold by backing the selections! Now that’s a good acca strategy! Get more details on the SBC Fink Tank System here. If the Fink Tank method sounds too complicated or if you want even more ideas, then there are some other options we’d recommend. One account not mentioned is @footballformlabs who put up some excellent analysis on Twitter and in their weekly newsletter. Picking out some of their recommended bets from the free email is a neat way to shortlist your bets for the weekend. You can sign up to their free email here. Another way to avoid making a bad weekend acca is to avoid following one of football’s many myths. The more that radio talk show hosts bang on about myths like ‘bogey teams’, the more you can be sure that the idea of a bogey teams is another football myth. Myth #1 Premier League Derbies Are Dirty Affairs: Actually the Premier League is the cleanest of all of Europe’s top divisions and there is on average just one more booking point per game compared to the Premier League average! Myth #2 Mid Week Champions League Fixtures Hurt Team Form: There is no significant difference in top team’s performances on the weekend after a mid-week Champions League game. Myth #3 The Existence Of Home Specialists: Are some teams massively better at home (or away) because they are a home (away) specialist? Nope! Home teams generally perform better than away teams, but any team over performing in the short term will just revert back to normal eventually. For example, in 2006/07 Liverpool, having gained 95% of their total points at Anfield in the opening 12 games, finished with an unremarkable 59% of their total points coming from home matches. Myth #4 There Are Bogey Sides: When a team goes on an extended run against a rival in head to head games, we’re often quick to label them a bogey team. Yet in the long run, these patterns are just random. Backing the bogey team because they’ve won all five of the last meetings will not increase your betting profits and may cause you to lose money. Myth #5 The Returning Gaffer Curse: Do managers returning to their old clubs hold an unfair disadvantage? You guessed it, nope! Successful betting is a long term game and with patience, playing the weekend acca can be a profitable angle. Whether you continue to play the multiples to keep one over on your friends or a way to achieve the occasional jackpot we hope this guide has been useful. There are two schools of thought when it comes to Racing’s Cheltenham festival…First there are those who lap up the excitement and dramatically increase their staking. On the other hand, there are those who see it as just another racing fixture that shouldn’t be treated any differently. Regardless of your perspective, we hope you’ve had a profitable week. And as the festival draws to a close, we’d like to sweeten any post Cheltenham blues with a discount of up to 15% discount off an SBC membership. One of the unsung benefits of a Smart Betting Club (SBC) membership is the ability to access our vast archive of tipster reviews, expert betting guides and interviews. As soon as you sign-up for an SBC membership you gain access to all publications from the last 12 months, however with Gold and Platinum Memberships you can gain access to our full 8 year+ back catalogue. This back catalogue is vast and gives you the opportunity to read hundreds of our past independent tipster service reviews – helping you find the most profitable tipping experts (and more importantly those who have a track record in the long term). You’ll also discover countless betting strategies and ‘how to’ guides that you can apply right now to help make your betting more successful. 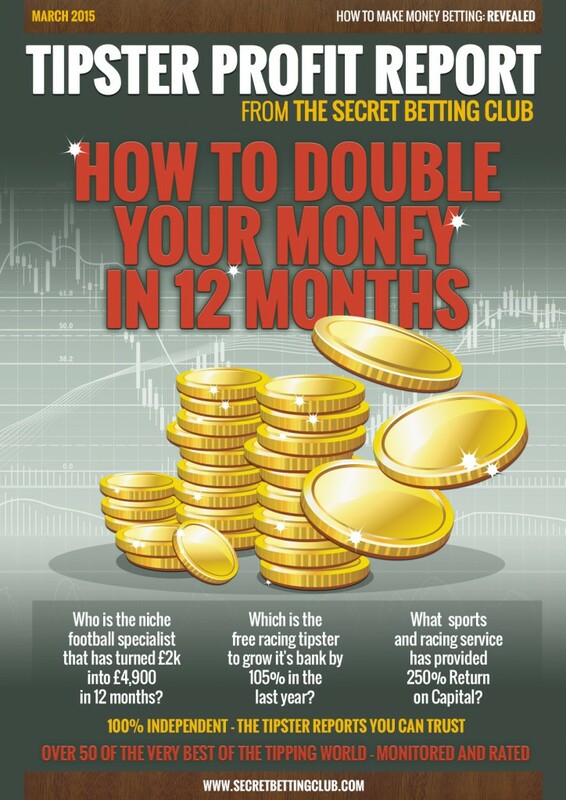 Also, if you need any additional assurances that the average Joe punter can actually make money betting, then you can also read numerous interviews with various betting experts – from bookmakers to pro punters and everyone else in-between. • Bookie Fairplay Campaign. Pg 5. • SBC Interview: Mick Mcdermott. Pg 20. Tipster Profit Report: The latest tipster results in our easy to digest update. Find out who’s hot and who’s not. Practical Punter Reports: Real life tips and insights from betting professionals. The 4 Pronged Attack Racing System: Our free method for finding big profits at the big races. ‘On Course For Golf Betting Profits’ System: Our free method for finding regular winners in the tricky field of golf betting. The Secret Betting System Guide: Our collection of some of the best free systems and strategies previously published in the Smart Betting Club including ‘How to profit from reality TV betting’ and ‘How to profit from horses to follow lists’. The Professional Gambler Blueprint: Everything you need to set you on the path to becoming a professional gambler from efficient staking to betting on Asian Handicaps. How To Get The Betting X Factor: Professional tips on how to handle the ups and downs of betting. Outstanding profits from our exclusive Football Combo Strategy: When three tipsters are far, far better than one! Exclusive Fink Tank Bets: 9% ROI and £890 profit from these exclusive system qualifiers. Greeneye Racing Tips: During his first 12 months tipping on the forum, this racing tipster expert has made an 8.34% Return on Investment from over 300 tips posted for free. Badrinath 10% ROI: This well-connected tipster has been posting free racing tips on our forum since October 2014 with over a 10% ROI from his first 400+ bets..
Cheltenham festival is around the corner, but with bookmakers restricting accounts of winning punters on a daily basis, you begin to wonder if it’s worthwhile. It used to be a badge of honour to receive a bookmaker’s cease and desist letter, but now account restrictions can be dished out for minor infringements such as refusing to use an online casino! The Smart Betting Club track and monitor a huge number of successful betting tipsters, many of whom have built up impressive records over many years. Our members get access to some of the best sources of betting profits, but it would only partly be fulfilling our duty if we stopped there. We don’t just show you which tipsters to follow, we also provide practical tips on how to follow a professional tipster. Find out more here. If you are looking for real-life guidance on how to make a profit using tipsters, then our practical punter series is for you. The Practical Punter Reports are just one of the many additional benefits you gain access to with a Smart Betting Club Gold level subscription. Written by profitable semi-pro gamblers, Practical Punter Reports explore everything from the sports they bet on to the exact make-up of their betting portfolio (namely the tipsters they follow!). The idea behind these special reports is to provide both inspiration and encouragement to those trying to achieve the same goal – making money through tipsters. How to adapt in an environment where the bookies are becoming less and less accommodating. How to get an ROI 10%+ betting on horses on Betfair. Profitable angles for in-play football betting. Why waiting for value in-play makes sense. Sign up to a GOLD Membership TODAY! When To Take Betfair SP and When to Wait! If you’re using the exchanges to bet on horses, the biggest dilemma is knowing when to take the current price and when to wait until the off. As with most things in life, there’s no hard and fast answer to this conundrum, but semi-pro gambler Rowan Day has shared his tips in this month’s Practical Punter. The names of the services are available to members. When the bets, from whatever service come out, I’ll simply place an order at the price I know the service will record the bet at. Sometimes this is matched immediately, but more often the longest price available is a little shorter than what I need. With [Tipster A] bets, I then tick the ‘Take SP’ option offered should my order not be matched prior to the race going in-play. The reason I do this is that so far, over a good number of bets, this service has proven to be profitable to Betfair Starting Price so I don’t feel as if I’m taking a massive risk of denting my profits too much if with the occasional bet, I’m taking the Betfair Starting Price. I estimate that 80%+ of my pre-race orders for [Tipster A] horses are matched prior to the race starting. And that’s a conservative estimate. On the day I’m writing this for example, there have been seven different horses tipped by this service; six of those bets had their orders matched prior to the race, but only one when I initially went to place the bet. The situation is a little different with [Tipster B] If there’s enough liquidity in the market when the tips are issued, I’ll simply be as quick as I can and secure the best price possible. This is because learning from experience, [Tipster B] is a master at identifying value and it’s not unusual for the horse to go off at a much shorter price than that advised, and it’s not all due to weight of subscriber’s money. If the liquidity isn’t there, I’ll adopt the same strategy as I do for [Tipster A]. [Tipster B] too, has a track record of turning a profit to BFSP. And it’s the same with [Tipster C] but to be honest I find nearly all of my orders being matched fine. It can be slightly more tricky when going for the place part of the each way bets given out, but even then I’ll be matched at the appropriate price far more times than not. Betting can also be a lonely game sometimes – and these reports are our way of trying to foster the most supporting ‘expert punter’ community possible here at the Smart Betting Club. 1 Year Access To the Smart Betting Club Magazines. 1 Year Access To Our Tipster Profit Reports. 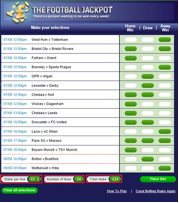 Qualifying Bets From Our Expert Football System. Profitable Free Tips On our Members Only Forum. Expert Insights In Our Pro Punter Bet Diary. Our Ultimate Betting Package Guide. Access Our Entire Back Catalogue. And Of Course… Our Practical Punter Reports! There were howls of derision when Brentford Chairman Matthew Benham introduced a new ‘continental’ structure with a head coach, director of football and reliance on performance statistics such as ‘shots in the danger zone’. But football luddites should take note – Benham is not someone to bet against. Firstly, there is the fact that he has already applied this structure at his Danish club FC Midtjylland, who are leading the Danish Superliga and on course for the first title in their history. Also, Matthew Benham isn’t your average football chairman. He’s also a professional gambler and founder of the highly successful SmartOdds betting syndicate. When asked by Midtjylland manager Rasmus Ankersen whether Brentford would get promoted from League One, his reply was typically devoid of emotion: “There is a 42.3% chance that we will go up”. Imagine Harry Redknapp saying that with a straight face! Thinking in terms of probabilities has been one of the key factors behind Benham’s successful betting career that has seen him earning millions in betting profits. Whether you are applying your own mathematical models like Benham or following a professional sports betting tipster, it’s the ability to control your emotions and focus on the probabilities that is key to success. The probabilities bettor understands he is neither right nor wrong on any one bet. His vision is long-term, any individual bet is irrelevant in the macro world in which he operates. Thus even if we have a belief system that says being “wrong” is bad and that we must be “right” all the time. That belief will not play out if one of our bets loses because we weren’t wrong to make the selection – it was consistent with our betting strategy, our money management rules were adhered to, we accept losses as a necessary function of winning, we have the long-term in mind and our edge is assured. We will still naturally be interested in our overall performance over time. We need to take an active interest in the feedback our results give us in the long-term. We need to be flexible to change approach if long-term results (i.e. the probabilities) dictate that it is necessary. These approaches are not at all inconsistent with being detached from day-to-day results. The probabilities bettor will have no expectation about a particular result. Having unrealistic expectations, or having realistic long-term expectations but expecting them to play out in the short-term, is certain to bring disappointment and pain. The unrealistic expectation creates a vision in our mind of what the future will hold. We feel sure it will happen, we’ve imagined the feeling of joy we will experience when it does happen, and we’ve already tasted it in our mind. We are expecting the winner of the 2:30 at Ascot to be Shergar ridden by Lord Lucan. When it doesn’t materialise the way we envisaged it in our minds we have an unfulfilled expectation. The degree to which we expected it, the joy we anticipated, will be the degree to which we feel the pain when it doesn’t materialise. In short, the mind screams like a banshee about how wronged it was! With the confidence of knowing we have a genuine edge and keeping the long-term in mind, a drawdown does not have a negative influence upon us. We have not defined ourselves or our success by one bet or even one day’s betting results. We and our betting results are part of a much bigger picture. Thus a drawdown loses its influence to overly concern us. We do not become discouraged. We remain optimistic because we know that as sure as night follows day, so does an upturn follow a drawdown. Thinking in probabilities allows us to have the mental discipline to follow our betting system and money management principles. The consistency we have in our mind is the rudder that keeps our betting ship on course, while the randomness of the betting markets might otherwise throw a lesser vessel off course. So these are four very real advantages to thinking like a pro, but how can you adapt your mindset? 1. Always believe that anything can happen: Never bet your house on something because you believe something is guaranteed – Who would have thought that Bradford would beat Chelsea! 2. Understand that you don’t need to know what is going to happen next in order to make money: You take a position on something uncertain like the result of football match, but you can’t control the outcome. 3. Keep in mind that there is a random distribution between wins and losses for any given set of variables that define an edge. Even a coin flipped 10 times could come up heads every time! 4. Remember an edge is nothing more than an indication of a higher probability of one thing over another. Just because you backed a horse at 6/1 when it should be 4/1 doesn’t mean it will win! It’s still a 4/1 shot! 5. Finally, accept that every moment in betting is unique. You’re never ‘due a winner’ and just because you nailed your football bets last weekend doesn’t mean you do it again this weekend. These five mental tips are just a sample of the many ways our Betting X Factor special edition can help improve your betting. If you want to learn more, sign up today to gain access instantly! We can’t promise you’ll become a successful football club chairman, but it will help you win the battle of the betting mind.